Cross Body bags There are 20 products. 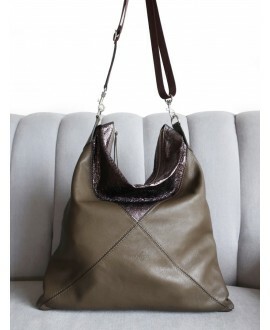 A beautiful medium sized leather handbag with a short handle that can allow you to wear the bag in your hand. While the long adjustable strap allows to wear across your body. 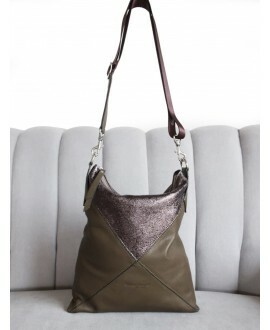 Aine bag olive and silver is an easy to wear and practical beautiful bag. 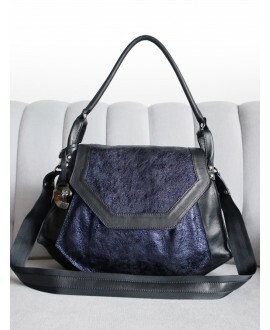 This Olivia bag is a beautiful and practical style from Ana Faye. In this stunning leather combination of top grain Olive cow leather teamed with a molten metallic pewter leather. It is the perfect large sized bag. 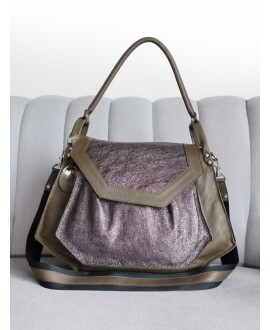 This Olivia bag is a beautiful and practical style from Ana Faye. In this stunning leather combination of top grain black cow leather teamed with a molten metallic navy leather. It is the perfect large sized bag. Aine Baby bag Black and silver sparkle leather, everybody loves this easy to wear and practical multifunctional medium sized bag. 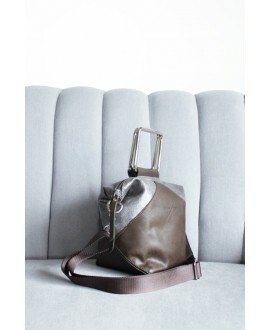 Natalie baby is the perfect medium small sized bag, made out of stunning top grade Italian leather in olive matt natural leather and special sparkle silver leather. Natalie is a brand new beautiful styles, which is equally as beautiful as it is practical. 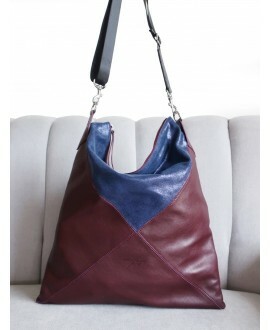 Aine Baby bag Burgundy and navy sparkle leather, everybody loves this easy to wear and practical multifunctional medium sized bag. It is the perfect large sized bag, made out of stunning top grade Italian leather in Burgundy matt leather and navy sparkle dust leather. 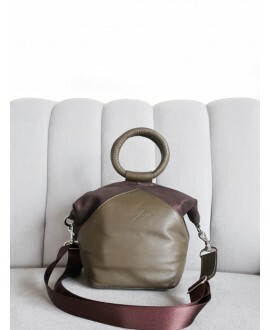 It is the perfect large sized bag, made out of stunning top grade Italian leather in olive and brown with a accent of molten volcanic metallic leather to match . Natalie baby is the perfect medium small sized bag, made out of stunning top grade Italian leather in olive matt natural leather and special sparkle brown leather. It is the perfect medium small sized cross body bag bag, made out of stunning top grade Italian leather in Olive with a accent of molten volcanic metallic leather. A streamlined backpack which is surprisingly roomy and spacious. Handmade using this stunning colour combination, Olive green Italian leather combined with a special Volcanic metallic leather in a kind of olive dark gold. It is the perfect large sized bag, made out of stunning top grade Italian leather in chocolate brown with a accent of molten volcanic metallic leather to match . It is the perfect medium small sized cross body bag, made out of stunning top grade Italian leather in Navy with a accent of navy molten volcanic metallic leather in navy.